These Zesty Nacho Deviled Eggs have all the flavour of classic deviled eggs plus a kick of taco spice and the crunch of Dorito crumbs. Perfect for game day, potluck, or any family gathering. 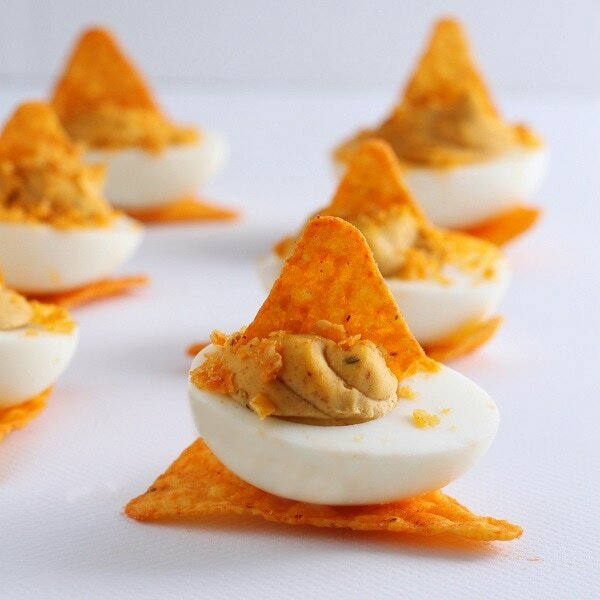 There are hundreds of recipes for Deviled Eggs out there…floating around on the interwebs. Go on, give them a search. I dare you! However, I like to start with the basics. 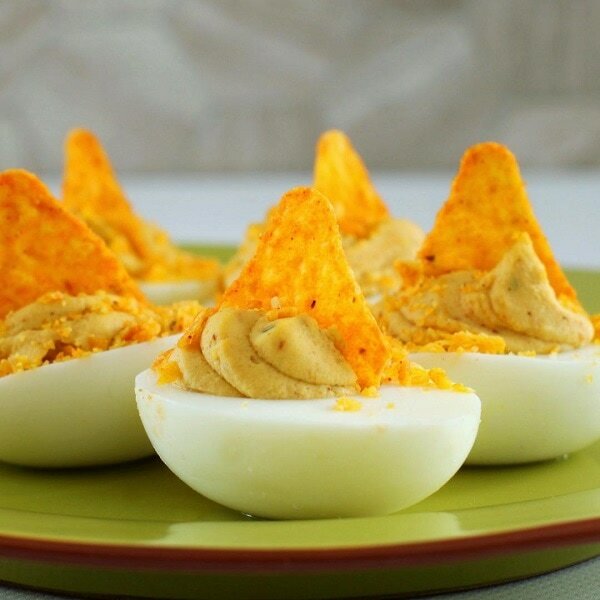 There really is nothing like the classic Deviled Egg. My mom was the first deviled egg influencer in my life. Her go to recipe is egg yolk, dried mustard powder, salt, pepper, mayo, and paprika. It’s a pretty basic recipe, but oh so satisfying. Once in a while she would get more creative and add some dried dill, cheese, or bacon and everyone thought she was a genius! Why Are Fresh Eggs Difficult to Peel? On the farm, it was easy to go pick up a few dozen eggs at Jackie and Sharon’s farm only a few minutes away. We would always keep those eggs in the fridge for a few weeks before boiling them and there’s a good reason for that. If you are using the boil method for hard boiling the eggs, fresh is not the best. In fresh eggs the membrane layer sticks tightly to the egg white and thus, the shell. As eggs age, the protective coating on the shell wears off and the egg becomes more porous. When oxygen enters the egg and mixes with the carbon dioxide produced in the egg, the egg white becomes more acidic. The acid makes the egg white less sticky and it also shrinks a bit. This creates a small space between the egg white and membrane…and the ultimate peeling egg! When I need easy to peel hard cooked eggs for Pickled or Deviled Eggs, my go-to method is the Instant Pot. There are so many Instant Pot hard cooked egg posts out there, it will make your head spin. I tried a few but I found that results vary according to the size and temperature of the eggs. 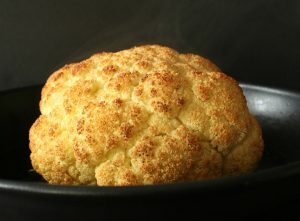 Many include natural pressure release time in their formula (5-5-5 or 6-6-6) but I found this leads to over cooked eggs. Overcooked eggs means that ugly grey yolk ring and no one wants that! To begin, place the metal rack in the Instant Pot. Add a cup of water, then stack the eggs on the rack. Cover and flick the pressure seal to ‘sealed’ position. For a large fridge temperature egg, cook on high pressure for 5 minutes, then immediately release the pressure. Plunge the eggs into a bowl of ice water for 5 minutes. I call this method the 5-5 method as it does not have that middle 5 minutes for natural pressure release. I have an obsession for all things taco. It really is as simple as that: I crave tacos and think tacos almost daily. One day it just hit me that my Homemade Taco Seasoning would be a delicious addition to a Deviled Egg yolk mixture. With the taco seasoning, I added some hot sauce because everyone knows, you can’t have tacos without hot sauce! 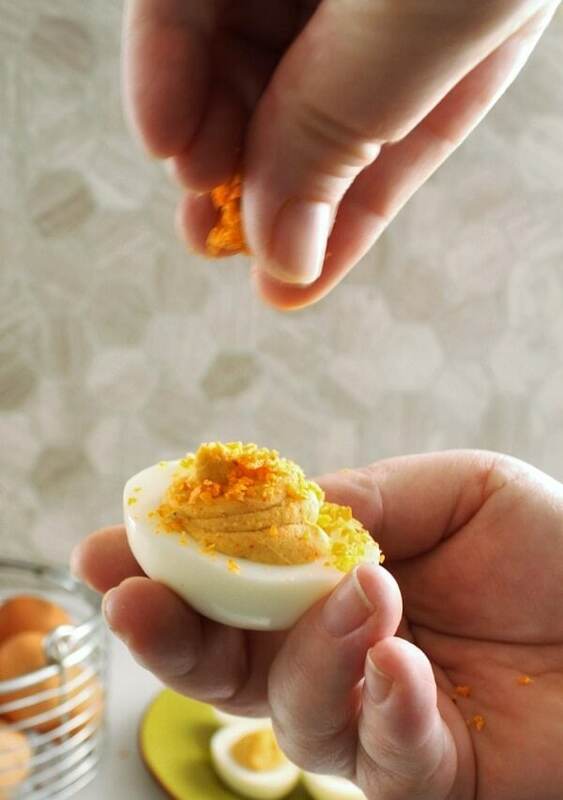 A sprinkle of Dorito crumbs adds both textural and visual appeal to the finished eggs. My mom is the original genius for her fancy Deviled Eggs and I’m proud to say that I’m carrying on that family tradition. 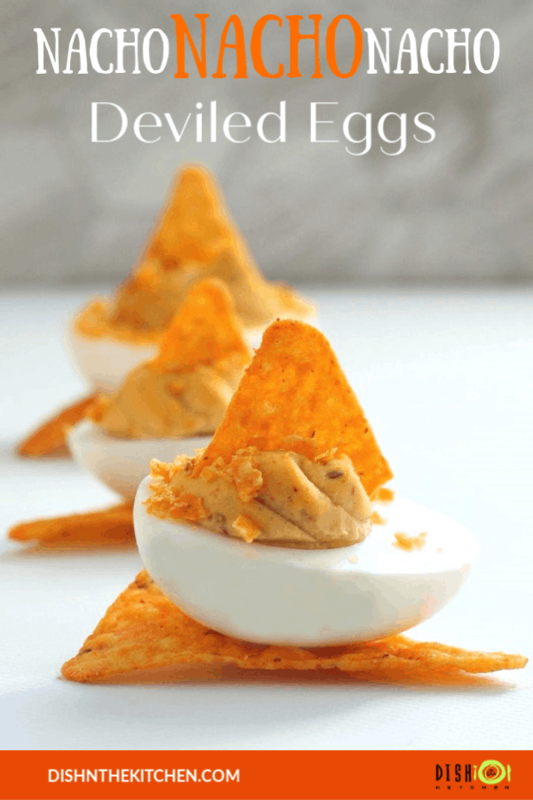 My son loved these eggs (it was his idea to serve them on a Dorito!) and my sister in law texted that I have to bring these for the next family gathering. I know they will be a huge hit! Carefully peel and halve the eggs lengthwise. Scoop the yolks out into a small bowl. Place halves on a plate. Add seasonings, mayonnaise, mustard, and hot sauce. Mash and mix until the mixture becomes smooth and no large chunks of yolk remain. Transfer yolk mixture to a piping bag or plastic bag with the corner cut out. Pipe filling in small swirls into the centre of each egg half. Place Doritos in a bag and smash them into very small crumbs. 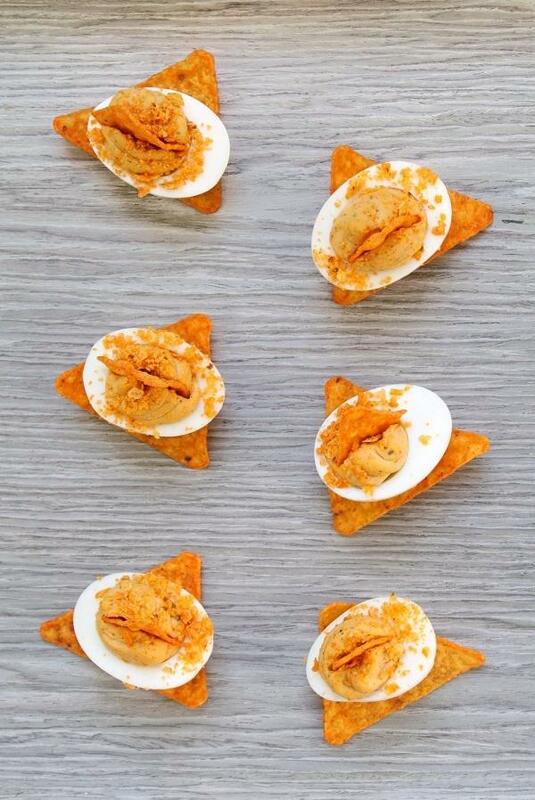 Use Dorito crumbs to garnish eggs and serve eat egg on a whole nacho chip. 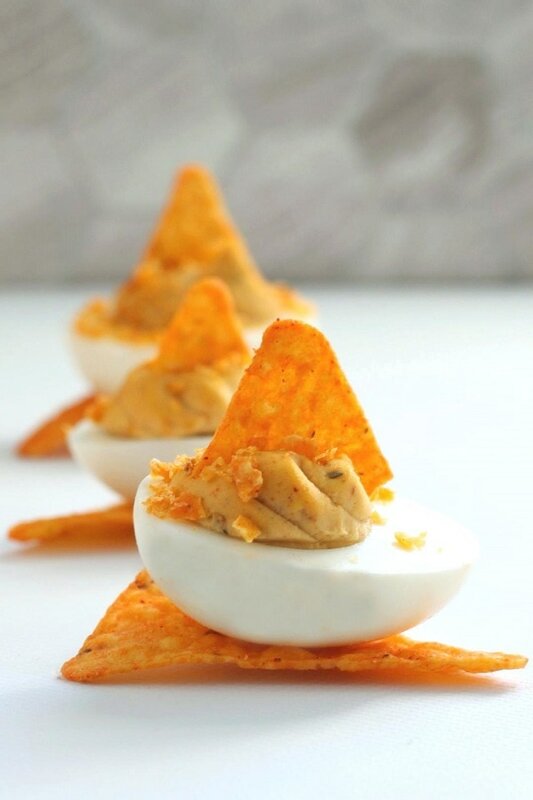 This recipe is the perfect intersection of two of my very favourite things – deviled eggs and Doritos! Adding this to my next party menu, because otherwise there’s a very good possibility that I might just eat the entire batch by myself… not that there’s anything wrong with that. PS: I can never get my hardboiled eggs to peel cleanly, so I am super-excited to try out some of your tips. Thanks! Hi Isabelle! Yes, they’ve already been requested for our family’s Easter feast! My son ate probably at least 2/3 of this batch, he is a deviled egg eating machine, lol. Great to see you back in the writing zone! This is such a fun app!! 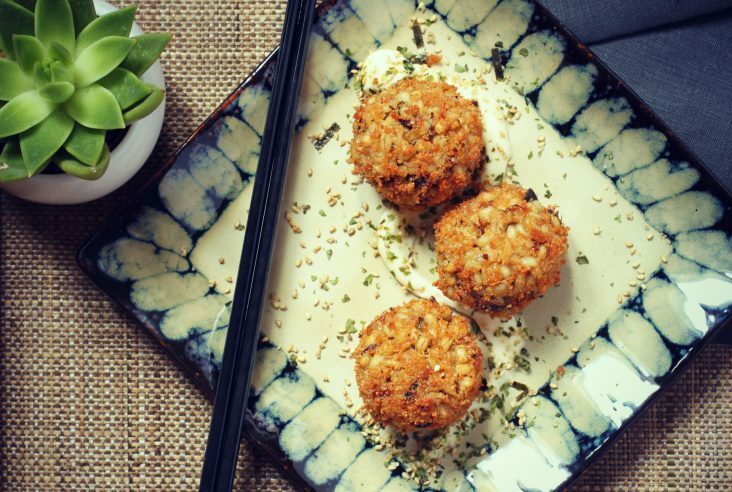 Love the presentation and the flavour! I bet these would disappear in, like, 5 seconds at a party! Oh, for sure!! I was pretty amazed by how many my son was able to put away all by himself. Maybe I should have adjusted the recipe to 2 dozen eggs?! 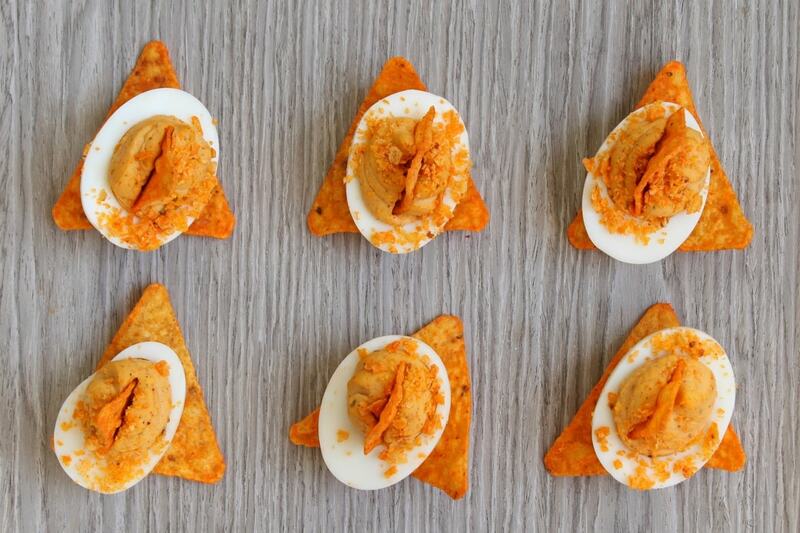 Great tips, Bernice and the cutest deviled eggs that I have ever seen. Cheers!